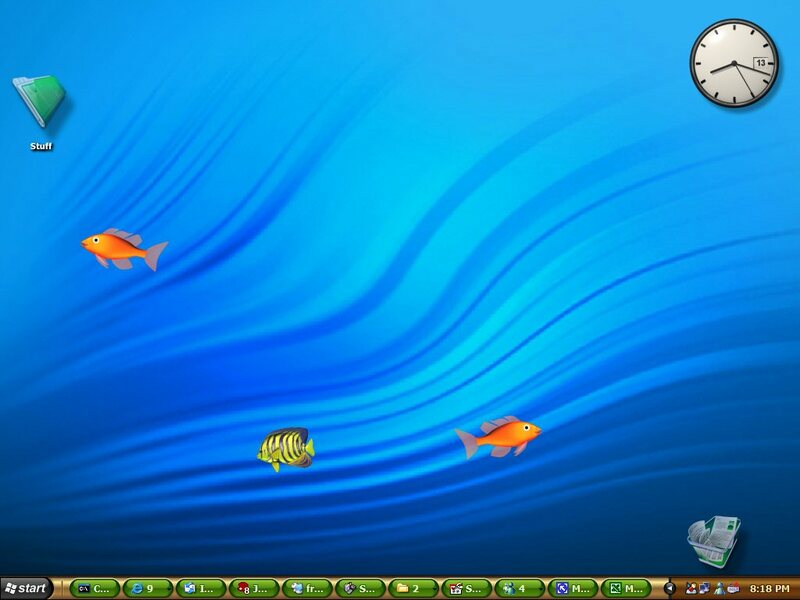 I've modified the fish in this theme to swim around on your desktop and not go wandering off too far so that you always have some fish actually on the desktop. My wallpaper is pretty basic so if someone has a fancier one they'd like/allow me to use let me know and I'll update this. I agree. I think you have the ingredients for possibly the coolest theme ever! Brad can I steal,uh,I mean can I use some of your fishies in another theme? Well I have one for ya if you want you can use mine I will be adding to it soon. And as it looks now it will never be posted. If ya want a look at it look at my info I have it up as my destop image. lol never mind it got moderated. I like Dreamdesign's wall. I am using it now ... it has lots of space for me to build an environment, and the lighting is great. "I've modified the fish in this theme to swim around on your desktop and not go wandering off too far so that you always have some fish actually on the desktop." This is what the Description says. They are staying in the same spot... They arent swimming around. Great idea you guys got going here, but I seem to be having the same problem with the bar at the bottom remaining the same.